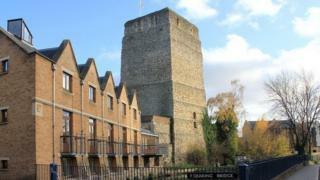 Conservationists fear a new hotel recommended for approval will harm views of a Saxon tower in Oxford. Dominvs Group has submitted plans for a 140-room establishment on Paradise Street, near St George's Tower. Oxford Preservation Trust said the hotel is too large and would harm the area's character. But a planning officer report said conditions imposed on the application would preserve the tower. The Grade I Listed St George's Tower is part of the Oxford Castle complex and one of the city's oldest buildings, dating from the 11th century. The Oxford Civic Society and a number of residents objected, but Historic England withdrew concerns when it described the plans as a "a great improvement on previous proposals." The scheme will be discussed by an Oxford City Council planning committee later.